Water to Help Kids Learn - Planet Aid, Inc.
Usually when people think about improving education, they think about hiring better teachers, increasing funding, and buying new school supplies. While these are essential steps in strengthening an educational system, in many countries of the world improving education is not just about pedagogy or pencils. Multiple cross-cutting factors need to be addressed if children are to enroll and stay in school. Among these factors is the issue of clean water. The worsening global water crisis is affecting the education of millions of children across the globe. Too often, water is impotable because of a lack of local sanitation. Every year children throughout the world miss 443 million days of school because of water-borne illness. We know that access to school is absolutely essential to a country’s sustainable development, and yet water insecurity and lack of sanitation places so many hurdles in the way that it becomes difficult to make headway toward educational goals. Planet Aid's Food for Knowledge (FFK) project in Mozambique is providing schools with access to clean water and improved sanitation facilities. By building wells, installing water pumps, and creating separate latrines for girls and boys, the project ensures that schools have the facilities students need to stay in school. 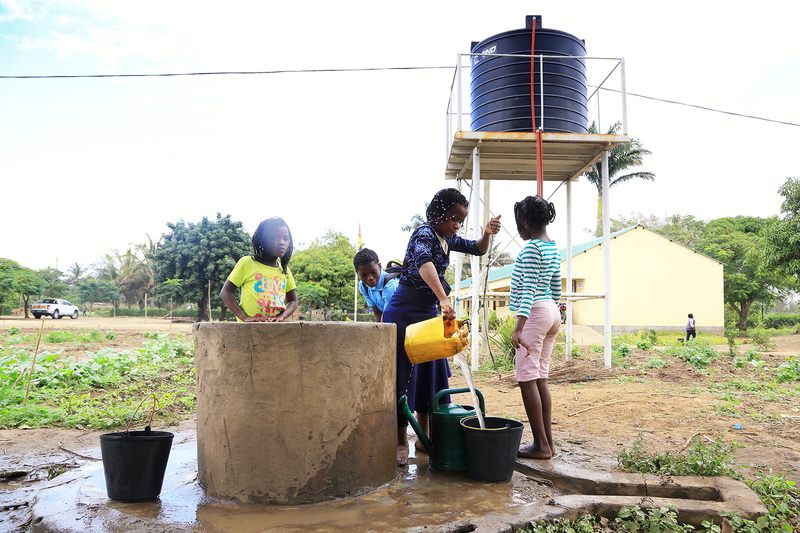 The new or improved water infrastructure being installed is a key component of FFK, a holistic education and nutrition project funded under USDA's McGovern-Dole International Food for Education and Child Nutrition Program. In both villages and schools, investments in water and sanitation greatly increase access to education for children. The construction of wells removes the burden of fetching water by young girls and minimizes the prevalence of water-borne diseases from surface water that force children to miss class. Additionally, the establishment of separate, private bathrooms for girls and boys in schools that are nearby, clean, and safe prevents the spread of disease and lowers the risk of assault.